old boss, Terry Carter, I was reminded of the last time they came together there and poor Terry had problems, so I thought I would republish the article I wrote in the newspaper at that time. 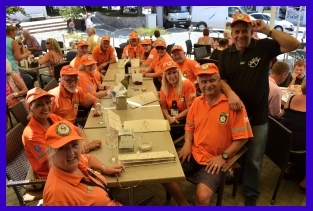 “I was recently in Girne at Cafe George just off the Belediyesi square when lots of orange tee shirts appeared worn by the CESV volunteers who had all arrived for a lunch date. who had arranged for the supply of 50 new caps for these Search and Rescue Volunteers. 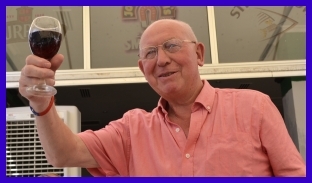 George who hails from Millwall in London returned to Cyprus around 13 years ago and has been running the Cafe George for around two years now and is very well known for his support and hard work helping charities as well as running a great place for folk to meet, eat and drink and be well looked after. of some face make up worn at an event the night before. Out came the first aid kit and his eyes were treated with drops by Jackie Jones and then he was rushed off to the hospital for a check up and I am pleased to report that Terry is now fine with no other side effects. Be prepared, you never know when help is going to be needed”! For those reades who wish to learn more of CESV and they training sessions or how to become a member of the CESV – Emergency Service Volunteers, please call Steve Collard 0n 0548 845 5927.